Malawi has the well-deserved reputation as being one of the friendliest countries in Africa. It's a densely populated, landlocked country, with almost a third of its territory taken up by the stunning Lake Malawi. The huge freshwater lake is lined with excellent beaches and filled with colorful fish as well as the occasional hippo and crocodile. There are some good wildlife parks for those interested in a safari, as well as several hiking destinations that include Mulanje mountain and the Zomba plateau. Location: Malawi is in Southern Africa, east of Zambia and west of Mozambique. Area: Malawi covers an area of 118,480 sq km, slightly smaller than Greece. Capital City: Lilongwe is Malawi's capital city, Blantyre is the commercial capital. Religion: Christian 82.7%, Muslim 13%, other 1.9%. Climate: The climate is sub-tropical with a main rainy season (December to April) and a dry season (May to November). When to Go: The best time to go to Malawi is October - November for safaris; August - December for the lake (snorkeling and diving) and February - April for the birdlife. Malawi's main attractions include the wonderful lakeshore, friendly people, excellent birdlife and decent game lodges. Malawi is a wonderful budget destination for backpackers and overlanders and for second or third time visitors to Africa looking for an authentic low-key African holiday. Lake Malawi - The lake is 360 miles long and 52 miles wide, (hence sometimes known as the "calendar lake"). It is lined with excellent beaches and is one of the cheapest places to learn to dive. There are more species of cichlids here than anywhere else on earth. The southern lakeshore is now a national park and you can opt for any level of accommodation. 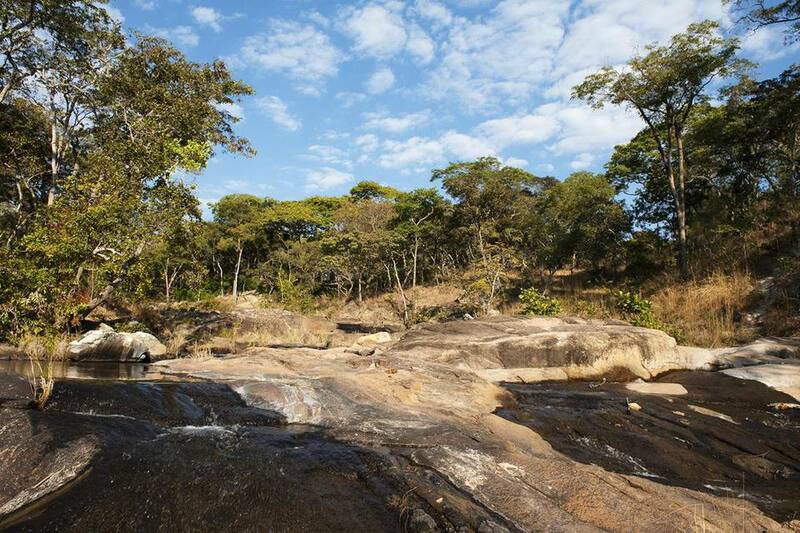 Liwonde National Park is Malawi's premier national park with lodges on the Shire River providing a lovely backdrop to a huge variety of birds, hippos, elephants and many more species of wildlife. Mulanje Mountain - One of Africa's top trekking destinations, Mulanje Mountain offers wonderful hiking opportunities to reach its 3,000m summit, and other craggy peaks, with many trails in pristine landscapes with waterfalls and streams. Blantyre - Malawi's commercial capital and a great place to unwind, get some shopping done, enjoy some live music and decent restaurants - especially if you're ​overlanding or backpacking through this part of Africa. Zomba - Zomba was Malawi's first capital and it's still a nice town, with a colorful market. But the main attractions here is the Zomba plateau, a lovely mountain with excellent fly-fishing, horseback riding and cool mountain paths to enjoy exploring. Malawi's International Airport: Kamuzu International Airport (LLW) lies 12 miles north of Malawi's capital, Lilongwe. Malawi's new national airline is Malawi Airlines (flights scheduled for Jan 2014). The commercial capital Blantyre is home to Chileka International Airport (BLZ), a more regional airport for those flying in from southern Africa. Getting to Malawi: Most people arriving by air will land at either Chileka or Kamuzu International airports. Flights to and from Zimbabwe, South Africa, Kenya and Zambia operate several times a week. British Airways flies direct from London. There's an international bus service to Blantyre from Harare, and various border crossings into Malawi from Zambia, Mozambique and Tanzania that you can reach with local transport. Malawi's Embassies/Visas: Check online for a list of Malawi Embassies/Consulates abroad. The Economy: Landlocked Malawi ranks among the world's most densely populated and least developed countries. The economy is predominately agricultural with about 80% of the population living in rural areas. Agriculture accounts for more than one-third of GDP and 90% of export revenues. The performance of the tobacco sector is key to short-term growth as tobacco accounts for more than half of exports. The economy depends on substantial inflows of economic assistance from the IMF, the World Bank, and individual donor nations. Since 2005 President Mutharika's government has exhibited improved financial discipline under the guidance of Finance Minister Goodall Gondwe. Since 2009, however, Malawi has experienced some setbacks, including a general shortage of foreign exchange, which has damaged its ability to pay for imports, and fuel shortages that hinder transportation and productivity. Investment fell 23% in 2009, and continued to decline in 2010. The government has failed to address barriers to investment such as unreliable power, water shortages, poor telecommunications infrastructure, and the high costs of services. Riots broke out in July 2011 in protest over decreasing living standards. Politics and History: Established in 1891, the British protectorate of Nyasaland became the independent nation of Malawi in 1964. After three decades of one-party rule under President Hastings Kamuzu Banda the country held multiparty elections in 1994, under a provisional constitution that came into full effect the following year. Current President Bingu ​wa Mutharika, elected in May 2004 after a failed attempt by the previous president to amend the constitution to permit another term, struggled to assert his authority against his predecessor and subsequently started his own party, the Democratic Progressive Party (DPP) in 2005. As president, Mutharika has overseen some economic improvement. Population growth, increasing pressure on agricultural lands, corruption, and the spread of HIV/AIDS pose major problems for Malawi. Mutharika was reelected to a second term in May 2009, but by 2011 was showing increasing dictatorial tendencies.